This post won’t have much medieval in it, I’m afraid, and will likely have a lot of stream-of-consciousness to it (can’t say for sure at the time of this first line – I’ll know better once I finish think-typing). I read two interesting articles recently. In Speculum Alex J. Novikoff discusses Lanfranc, Anselm and the monastery of Bec and how they influenced intellectual thought and, specifically, the rise of scholarly dispute as a source of philosophical and intellectual inquiry. 1 This is a very interesting article and one which fits in well with a paper by Justin Lake I heard at Kalamazoo last year, but it’s not a topic I know much about, certainly not enough to comment. As an aside, I should thank the Medieval Academy for continuing to send me Speculum even though I chose not to renew my membership this year. The May edition of EME is out with an article by Levi Roach on evidence for ritual in late Anglo-Saxon diplomas. 2 Again, interesting stuff but not something I’m qualified to discuss. What did interest me is this notice on the Wiley online EME page: “Early Medieval Europe has now adopted ScholarOne Manuscripts, for online manuscript submission and peer review.” I don’t believe I’ve seen this before from them. This is a good thing. It’s 21st century, greener (probably), certainly quicker and, if the site gives you a receipt, means things won’t be lost in the mail when those pesky international address codes trip you up (or when mail delivery does the tripping). I’ve often wondered why the exhibit (AKA book) hall at The International Congress for Medieval Studies isn’t wired so we can pay for books electronically. You can use CC, they just pull out the old 5-lb machine and mechanically swipe your card, complete with a paper copy. Old School. And definitely not greener. I’ve often thought a nice way for me to actually stay within a budget would be to put so much money on my debit card, pay for books that way, and when the card tells me (and the vendor) that I’ve used up my allowance, I can quit. I’m disregarding the fact (and based on my personal history it is a fact) that I would then pull out a CC and pay for it and all subsequent purchases that way. I’ve heard of people with a gambling addiction. I’ve never had that problem but when it comes to books, well, let’s just say that Kalamazoo is my Vegas. Back to the point of this post, if there is a point (see what happens with stream-of-consciousness? Maybe I should just title this post, “Dear Diary”), ten years or so ago when I worked with younger folks I was interested in studies which showed that kids who spent substantial time using computers from an early age showed minute changes in brain development when compared with those of us who spent our early years looking at paper. At the time, the research didn’t feel these changes were good or bad, just different. The studies (this is long enough in “the ago” that I can’t cite anything, sorry) postulated that for the rest of their lives these kids would be better able to absorb and process information they found on a computer screen than us dinosaurs. Conversely, dinosaurs would always have an advantage with paper. And I am a dinosaur – my first ever use of a computer was using Basic in college and I was a member of the last class at Cornell to use punch cards in our computer class (PLC/PL1, IIRC). To this day I steer clear of electronic reading devices such as Kindle and Nook and if I read an article online that interests me, not only do I save it to my PC but I print it off to read more closely. You are not able to save your work on this site. Do not begin entry until you are able to submit. Clicking the “save” button will irrevocably commit you to fulfilling requirements which may be grammatically and, possibly, even logically incorrect. They’ve gotten better at it. I recently (due March 15) submitted an abstract to present a paper at a national conference where you could save your work and were instructed not to submit until you were sure you had your act together. I’m not sure if it held your hand enough to where it would tell you if you exceeded the 250-word limit. However it still had two flaws. First, it did not give me a receipt on submission – I have nothing except my good name to wave around if, three weeks before the conference I ask someone, “What did you think of my proposal?” and get a response, “What proposal?” The second, probably less critical, is it did not offer me an option to view my proposal as it would appear to a reviewer. I could (and did) save it to a Word document but the dinosaur in me always wants to know how what I write, however small, will look in print. I like the little “view” option even though I can do that myself through copy/paste/PDF-it. Electronic submissions are a good thing but folks need to make sure they’re set up correctly. For me, electronic submissions are less “green” than you may imagine because I end up with multiple drafts and print each one off to examine for content and style (readers are by this time likely wishing I’d done the same for this post). And you absolutely need a receipt system. I have no idea what the EME system includes. I have not and will in all probability never submit to them. Maybe it has all this but in case someone involved in electronic submissions (for EME or anyone) runs across this post, please make sure the process isn’t simple just for the submittee, but for the submittor. As for my proposal, haven’t heard a thing, not even an e-mail that the committee has received it. I’d like to find out. For one thing, if it’s accepted, all my expenses will be paid by an organization. If not I have to start begging from multiple folks (I’m sort of locked into going since I volunteered to staff a booth for a couple of shifts). Begging is best done early, before budgets run out. Also, the conference is in early August, less than 4 months from now. It won’t be long before that turns into “next week” and while I know my topic, it would be nice to be working on the presentation now in my spare time. 1 Alex J. Novikoff, “Anselm, Dialogue, and the Rise of Scholastic Disputation,” Speculum 86 (2011), 387-418. 2 Levi Roach, “Public rites and public wrongs: ritual aspects of diplomas in tenth- and eleventh-century England,” Early Medieval Europe 19 (2011), 182-203. 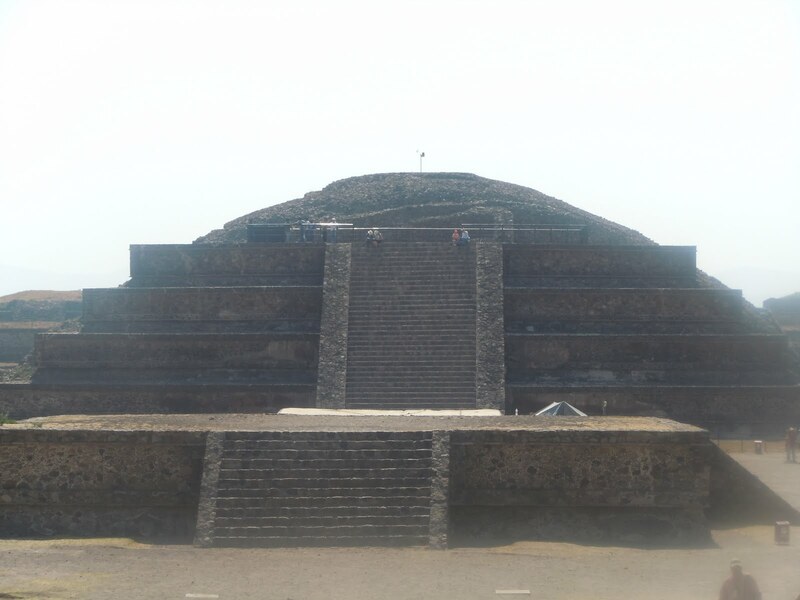 I know Mesoamerican isn’t technically medieval but I enjoyed the visit to Teotihuacan and it isn’t so off base that anyone will hurt me for posting about it, I hope. I took a lot of pictures while in Mexico. If anyone wants to see more of them, I put about a third of them up on Facebook. This was a multi-state cultural immersion program with representatives of 12 US Universities. This was pretty structured with visits to various points of interest at several locations in Central Mexico, ranging from a holistic health clinic to the US Embassy. This day was our last full one in Mexico before returning and while the Teotihuacan visit was part of the cultural experience I think it was also scheduled as something of an “unwind” where we could relax a little (mentally) before coming back to the US. The first thing I need to say is that my knowledge of this site is no greater than what you can find elsewhere on the web. We had a tour guide but a bunch of us skipped out on that because we only had three hours and wanted to climb pyramids. One of the most interesting items is that even though it is a very significant site and well preserved, little is known of its origin or its founders. The site is much larger than the pyramid area which was a religious center for a city with an estimated population of as much as 200,000. Teotihuacan construction began during the second century BC and continued for the next several centuries, until the 3rd century AD. The city was occupied until the 7th or 8th century when it was mysteriously abandoned. It was the center of a large culture, with influences found throughout Mesoamerica, particularly among the Mayans. The reasons for the abandonment of the site are not completely clear but it appears to fit under the broad category of “massive social unrest/uprising following an extended period of population decline.” Skeletons dating from the 6th century show evidence of malnutrition and by the time the site was abandoned the population level had dropped by as much as 50%. The residents practiced Human sacrifice. Excavations around the pyramids, particularly near and under the Serpent Temple, have found quite a few remains of folks who were killed by decapitation, had their hearts cut out, etc. They believe those executed were mainly enemies captured during warfare or on raids but when things were tight they likely used members of their own population – it’s unknown if these were volunteers. The Feathered Serpent Temple of Quetzalcoatl. This appears to have been a major point for ritual sacrifice. After climbing it, I thought the others wouldn’t be too tough which I later found to be untrue. 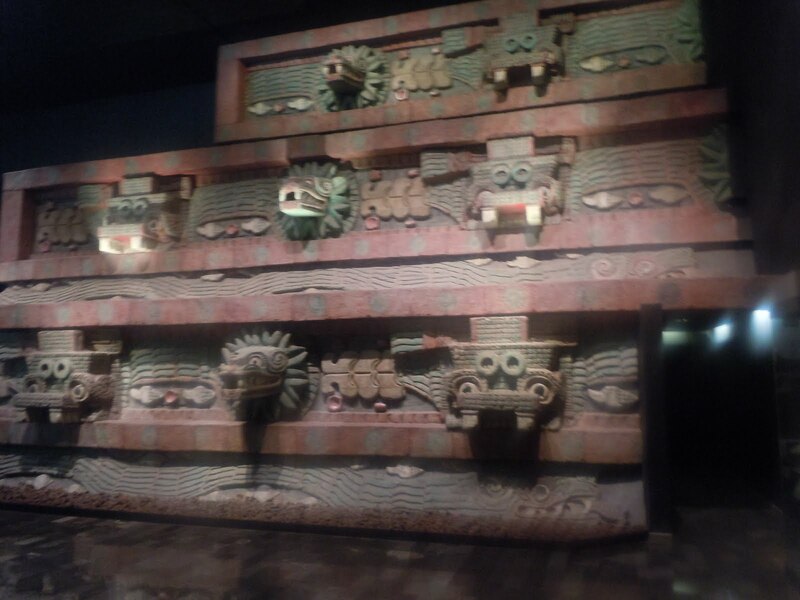 Facade from the Temple of Quetzalcoatl on display in the Museum of Anthropology in Mexico City. I neglected to write down whether this is a reproduction or something transported from the site. My apologies for the image quality. I bought a new camera for this trip and evidently hadn’t figured out the settings for use without the flash. I have pics from the site but this is much better, despite the fuzziness. 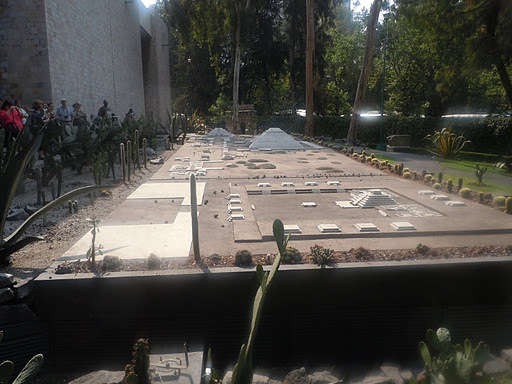 The Aztecs took over the site and used it for religious rituals. They also built several temples on top of the original structures. For the most part these did not survive as well as the original structures but often helped to protect the underlying remains. 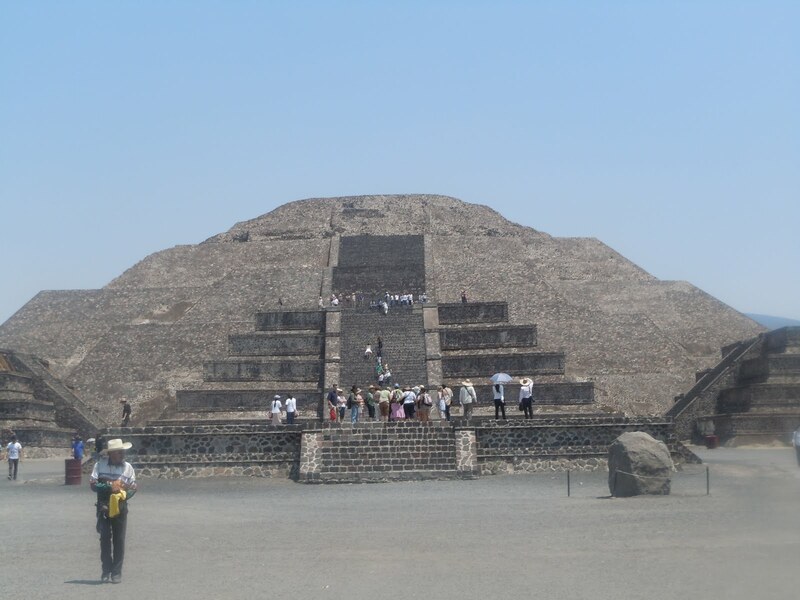 The Temple of the Sun is the largest structure at Teotihuacan and the third largest ancient pyramid in the world, slightly smaller than the Great Pyramid of Giza and significantly smaller (though taller) than the Mesoamerican Great Pyramid of Cholula, also located in Mexico. It’s 75 meters (246 feet) tall. Me, standing before the Temple of the Sun. This is the only picture of me I’ll show since in the rest I’m mainly standing with my mouth open and eyes closed waiting for my heart rate and breathing to return to normal. The function of the Temple hasn’t been pinpointed. An altar was built on top of the pyramid but hasn’t survived and few artifacts have been recovered from within. A royal tomb appears to be the most popular hypothesis but the interior chambers have been looted and not much has been found. It does not appear to have been a place of Human sacrifice however, or if it was, the bodies were interred elsewhere. As for the climb, it was tough. I took it in sections, pausing at each level to wait for my heart rate and breathing to return to normal before going on to the next. About 3/4 of the way up you may notice a section where the pyramid juts out a bit. That stretch of steps was murder – steep and each step was extremely tall with narrow places to put your feet. Someone told me that was put there because the priests used to run the whole way up and that slowed them down. I have a feeling this is a myth but if it was true those priests were some tough dudes. I had enough trouble just walking. Temple of the Moon, picture taken from on top of the Temple of the Sun. The Temple of the Moon, located at the North end of the site, appears to have been used for a combination of purposes. 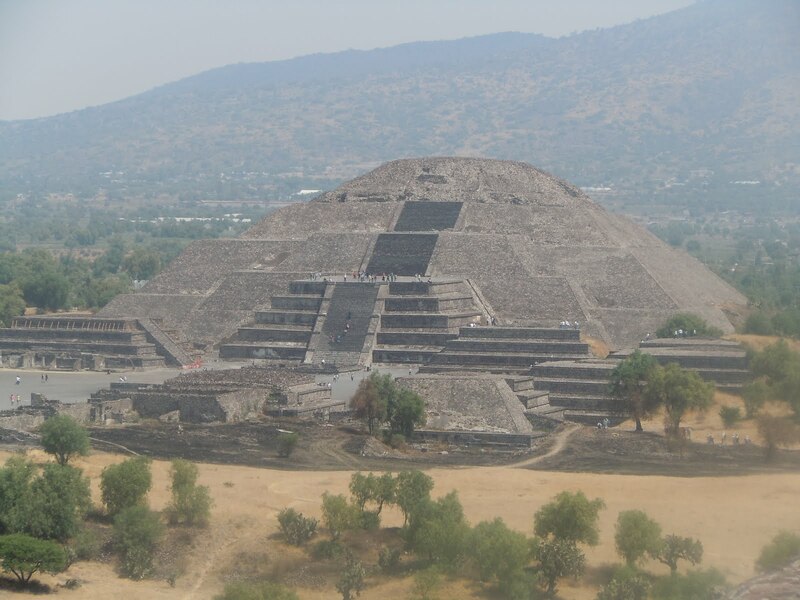 Rituals to the Great Goddess of Teotihuacan were conducted there; she was the Goddess of fertility and earth. Sacrifices were carried out there and tombs have been found within it. I have to mention two things. First, I wasn’t climbing this. Hauling my old, fat carcass up and down the Temple of the Sun had finished me. I was going to go to the base, snap some pictures, then wait for the vendors roaming around the site to swarm me. Those folks were all over but you could get away from them by climbing a pyramid. When I reached the base of the Temple of the Moon I saw this older gentleman, 75 years old at least, on his way back down, helping a 2-3 year old down. My first thought was, “That toddler climbed that?” Well, I don’t care if he was Super-Toddler – he didn’t climb it. That old man had carried that kid up the steps. After that, I had to climb it. That or turn in my man card. The second thing I learned is how I will die. At some future point I’ll look at something which I could have done fairly easily 20 years and 50 lbs ago, give it a try and fail in a spectacular, fatal way. I survived this one, but eventually I won’t. That’s OK – there are far, far worse ways to go. Temple of the Moon. At this point there was no way I was climbing it. The height of this climb was much less than for the Temple of the Sun, surely less than a hundred feet. But the steps were about a meter high and the foot-rests about 6″(15 cm.) wide. Tough haul. Fortunately (for me anyway) you were only allowed to climb to the first level. But it provided some great views of the site. Looking South from the Temple of the Moon along the Avenue of the Dead. The Sun Pyramid is on the left. 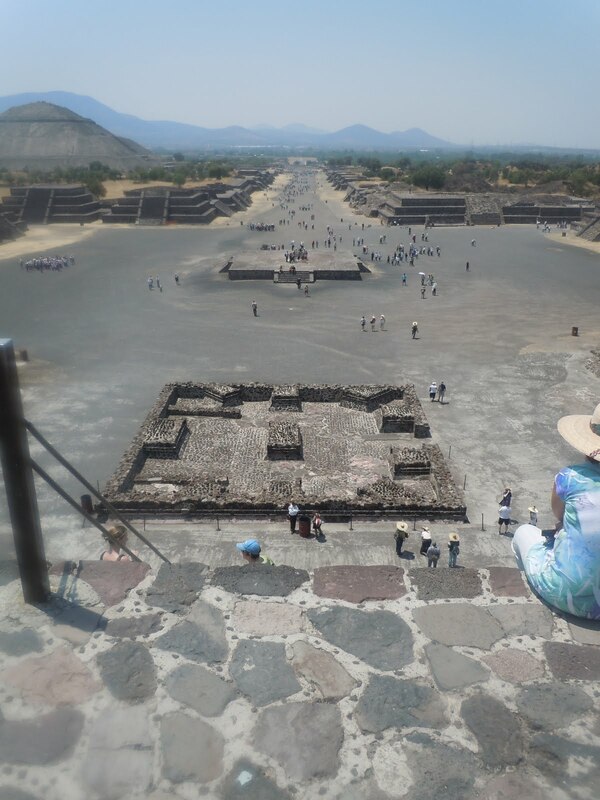 Picture of the Temple of the Sun, taken from the Temple of the Moon. 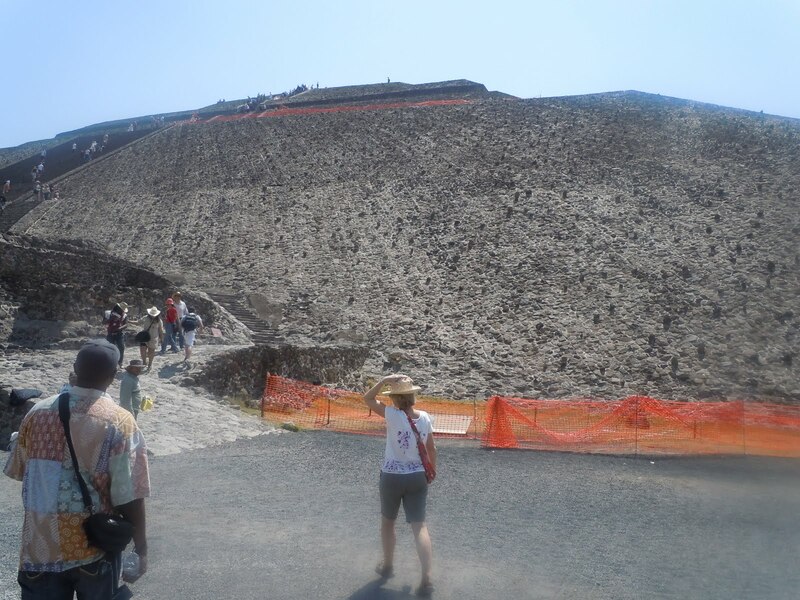 This may be my favorite picture I took at Teotihuacan. I enjoyed this visit very much. I wish we’d had more than three hours because there was much more to see. There was access to areas beneath the ruins at several points but I only visited one of them. Some excavation has been done of the surrounding city and I didn’t have time for that either. One day I expect to return to fill in those gaps. I know this isn’t strictly medieval but in this hemisphere this is about the best I can do. You just don’t get the sense of age in many places which I’ve been told you can find in Europe. Again, for more pictures you can check out the ones I posted on Facebook, about a quarter of the total I took over the week. I’m back from Mexico and very tired, too much so to make a decent post. I’ll offer this one image as a tidbit. Will I climb it? Slink away in shame? Get halfway up and cry like a cat stuck in a tree? 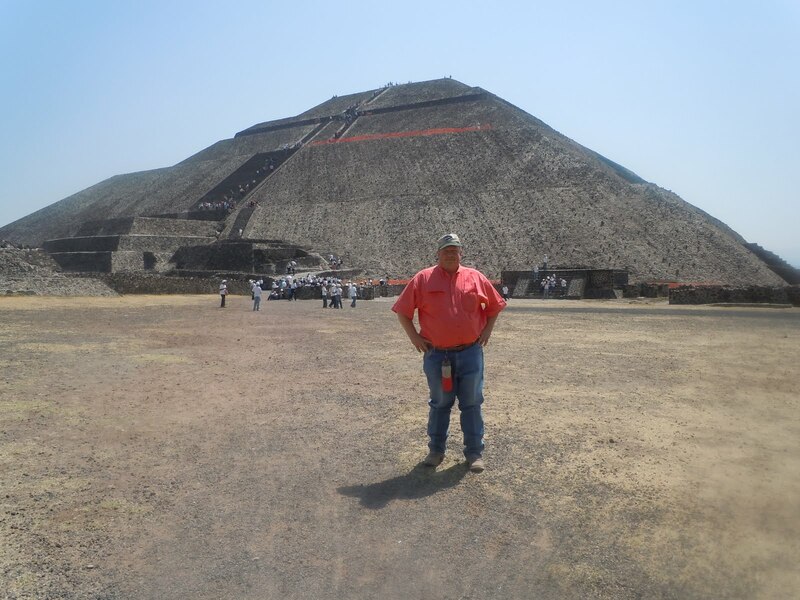 In the near future I hope to provide a post or two with details, including whether I try to drag my fat carcass up some of the pyramids at the site. I’m heading out early tomorrow to spend a week in Mexico and later this month I’m at another conference for a week. In essence, I’m in Indiana for 14 days this month and out of it for 16. That may be perfectly normal for some people, not so much for me. My house-sitter better clean up after himself. Unfortunately, that means this blog will likely suffer. I wonder if there’s a .wav or MIDI file out there where if someone clicks on this blog they can hear crickets chirping? 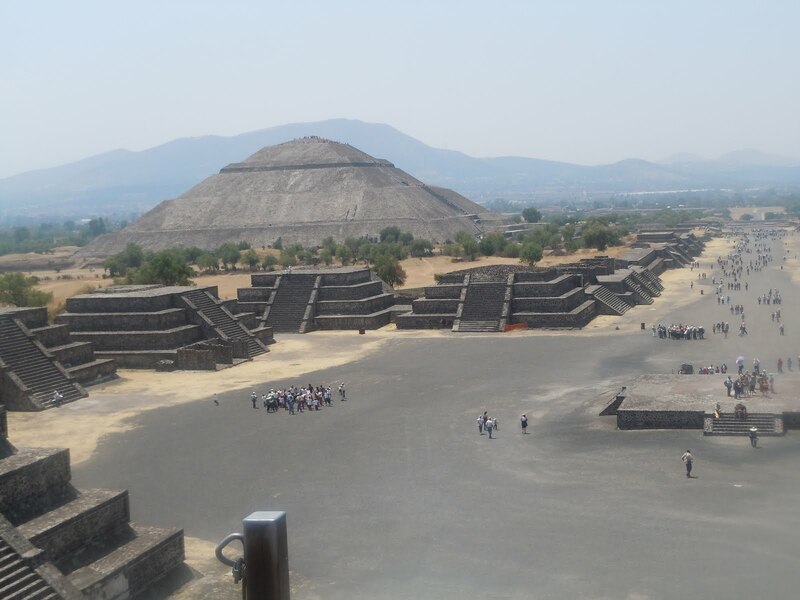 However, while the Mexico trip is for work, there’s some free time incorporated into the schedule including a trip to Teotihuacan. Is Mesoamerican considered medieval? I already know the answer – it’s not. However I think I’ll put at least a few pictures up anyway. I’ve always admired Gabriele Campbell’s blog, The Lost Fort, in part because of the wonderful photography she includes with her posts. Kornbluth Photography is also a favorite site of mine for the same reason. Fantastic pictures; those of you going to Kalamazoo should consider her workshop if you work with medieval images. I know I’m image-challenged with my posts. I keep telling myself I need to do better. While I’m on the wrong side of the Atlantic for taking Medieval pictures, I can put some of these up and I think most of the readers of this blog will enjoy them.